It's a Friday night, you're out and about, you're at some swanky restaurant, or grabbing some drinks at a bar, or you're shopping at the mall. You want to know if you're other friends are around so you can meet up, what do you do? Well, you take out your BlackBerry and load FourSquare, check-in and see who else is around. So what's FourSquare all about? It seems to be an app that lots of people have been talking about lately. It's a location based app that allows you to check-in to businesses, restaurants, shops, and places of interests. It's also a great way to find out where your friends are, see the places they've been and check those places out too. As well as that, while checking-in to different venues you collect points and badges depending on how often you check-in. The more check-ins in one day there more points you'll get. After your first check-in you get your Newbie badge, check-in at ten venues gets you an adventurer badge, twenty-five check-ins earns you the Explorer badge, there's even a Local badge if you've checked-in at a venue three or more times in a week. 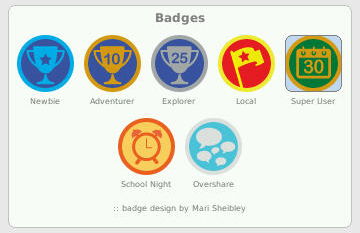 There are a whole host of other badges to unlock which I won't know of until I unlock myself. If you regularly check-in at one venue then you can gain the Mayorship of that venue which means that you're the person that has checked-in the most at the particularly venue. But you can also be ousted as Mayor if someone else then checks-in more than you. There are some people who do guard their Mayorship closely and will try to maintain this Mayorship and it's also something that makes FourSquare fun to use. But FourSquare is also a neat way for you to discover new places or discover neat little things about a venue that you should check out. There is a nifty Tips section where you can write a tip or a recommendation about a venue for other people to check out and do. For example, if you checked-in to a restaurant and you discovered a great dish that you loved, you could recommend this for people to try out. 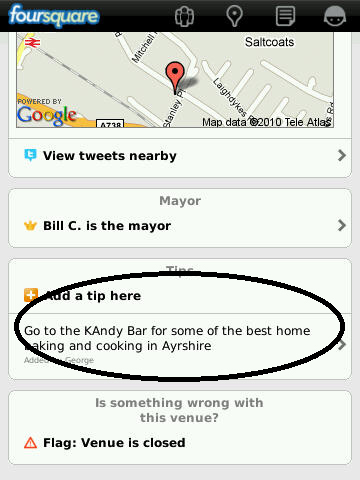 Likewise, when you check-in at a venue you could see if there were any tips for you do. You can then add these to your To-do list or add it to your Done list. It's a great way of discovering new things which I find a cool feature of FourSquare. In order to use FourSquare you'll need an account with them and you can create this right from within the app, which I find is a bonus. I get annoyed with some apps that take you to the browser to create an account. Once you've created an account you can then start checking-in right away. You also have the ability to link your Twitter and Facebook accounts so whenever you check-in somewhere your status will be updated with this information for all your friends to see, as well as your friends on FourSquare. One thing I don't like is that the only way to link your Twitter and Facebook accounts is via the FourSquare website. There's no way to add them via the app as of right now. If would make things easier if you could. You'll also find a Leader Board section that shows who's checked-in the most places between you and your FourSquare friends. This resets every week, so each week you could compete with your friends for top spot. This would work well if you had a lot of friends, especially in the same city. Are there any negatives? Well, one thing I've discovered while checking-in at venues is that it shows places that are a few miles away. The furthest location that has showed up for me was 6 miles away. This can be seen as a way of cheating as you could potentially check-in to places you haven't set foot in. However, this can also be useful if you forgot to check-in at a venue and you could do so afterwards. But this relies on users being honest with their check-ins. Though I'm pretty sure the majority of FourSquare users check-in to places they really have set foot in. I must admit I've forgotten to check-in once and check-in afterwards but I wasn't miles away, I was only down the road. So this is something FourSquare needs to work on but it is still in beta and hopefully it can be rectified by the time the full version is released. I've been using FourSquare for a couple of weeks already and I find the tips section the most useful part, especially when you go somewhere new or while you're on holiday. I recently went on a road trip and found the tips very helpful when I've checked-in at some venues. Collecting badges and points is also a cool, fun feature and what makes FourSquare appealing but I've found that you've really got to get your friends using it too, otherwise you're on your own and can get a little lonely and mundane. One thing I should mention is security. Remember this is a social app and a location based app. I for one don't check-in from home as I don't want the whole to know where I live. If you're adding people be sure you know them. And if you're going to link FourSquare to your Twitter or Facebook accounts remember people will know where are. Be safe and have fun with the app responsibly. 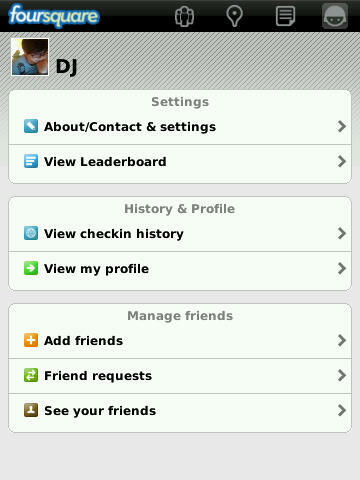 You can download FourSquare for free through App World or from the FourSquare site via your BlackBerry's Web Browser.